The countdown to the Gibraltar 2019 NatWest International Island Games reached another major milestone today with 100 Days to Go until the event begins. The summer event begins on the 6th July and will see over 2,200 athletes and officials travel to Gibraltar in search of gold across almost 200 different events across 14 sports. 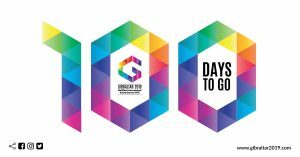 Gibraltar 2019 Games Director, Kim Chang said: ‘It is now just 100 days to go until the start of the Gibraltar 2019 Games, the biggest sporting and cultural festival Gibraltar has ever hosted.